This box will take some time to complete, but should be destined for heirloom status! It is our largest piece and the finished size is 8 cms high, 17.5 cms wide and 11.5 cms deep. 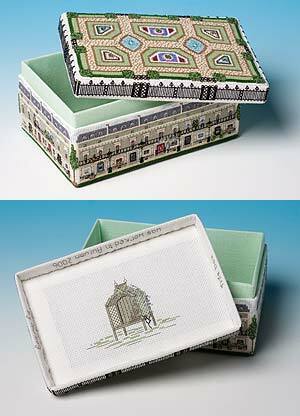 It is worked on 16-count antique white aida with a dark green evenweave base, and lined with mint coloured evenweave. The design represents a garden in a London Square, surrounded by iron railings, while the houses of the square are worked around the box sides. The image of a quiet arbour seat is worked inside the lid, and you may add personal details around the inside of the lid rim if you wish.